My day job and my side jobs have left me short on free time for a couple of weeks now and I've had just about zero time to do any writing, which is exactly how I want my life to not be. Over that time I've assembled a list of topics I want to write about on here but the list has only grown longer as the days have passed. I'm finally back now and the time is ripe to revitalize this dormant blog. I'll start with discussion of a few links to get the gears in motion and then I'll have many more posts coming up in the next couple days (I hope). First up is an article I found in the New York Observer from 1997 about the James Joyce scholar and "big academic troublemaker" who I discussed in my last post, Dr. John Kidd. Aptly titled "James Joyce and the Nutty Professor," it's a good read and it covers the entire story of Mr. Kidd in detail from his discrediting of Hans Walter Gabler's new edition of Ulysses in the 80s, to the elaborate version of the epic novel (complete with a CD-ROM which Kidd described at the time--keep in mind this is the mid-90s--as "the world's single most comprehensive digital document ever made") that Kidd worked on for years and received a $100,000 advance for, and full background to the "Joyce Wars" and the troubles scholars encounter when dealing with the Joyce Estate and the famous author's grumpy grandson, the only living James Joyce descendant (who paraphrases Shakespeare, wishing for "a plague on all [the Joycean scholars'] houses!"). The article is almost 15 years old and emphasizes the impatient wait for Kidd's supposedly superior edition of Ulysses which we still have not seen or heard about for a while. There's also a Boston Globe article posted on the Globe writer's blog about the quirky, reclusive Kidd entitled "A Plummet from Grace" which describes how Kidd was put in charge of a brand new James Joyce Research Center at Boston University right around the time of his exposing the Joycean scholarly giants but that now (or, at the time of the article which is 2002) he was completely out of academia "amid allegations that he sexually harassed and unfairly failed some of his students and concerns about his propensity for befriending a range of creatures, from worms to rats to pigeons." The piece describes Kidd as jobless, in poor health, and a frequent feeder and friend of pigeons on the sidewalk. The quotes from his friends ("I'm very concerned about him") don't sound very good and, not too long after the article, Kidd died in his early 50s with his highly sought-after edition of Ulysses unpublished. The president of the publishing company W.W. Norton explains that Kidd's Ulysses, if ever published at all, won't be for at least two decades. For a taste of the "Joyce Wars" that Kidd sparked in the 80s, you can read the exchange of letters from The New York Review of Books that includes a response from Hans Walter Gabler to his young challenger and even John Updike chiming in to add a few punches to the defeated Gabler. Kidd's response at the end of the exchange displays what made him such an engaging scholar (he writes satirically looking back from the year 2088) but also one who his contemporaries hated. How could the ill educated, penny-pinching son of a glove maker from rural Warwickshire be credited as the author of the greatest plays and poems in the English language? Beginning around 1800, the hunt started to find the “real” Shakespeare, the noble visionary who had exalted the spiritual struggles of humankind and celebrated the comedy of errors of our daily lives. In this engaging and well-researched book, James Shapiro charts the course of this pursuit of truth and beauty, arriving at conclusions that reflect both his insightful scholarship and common sense. Amassing an unassailable body of evidence, Shapiro proves that William Shakespeare of Stratford did indeed write the plays and poems credited to him, but not always as a solitary creative genius. Shapiro gives thorough and sensitive attention to the opponents of William Shakespeare's authorship, giving them "a fair hearing" but he dismisses them in the process. The book doesn't merely present an argument though, it also tells the story of the raging Shakespeare debate that's gone on for centuries with so-called anti-Stratfordians (those who hold that William Shakespeare of Stratford did not author the plays) counting among their ranks such prominent figures as Mark Twain, Helen Keller, Henry James and Sigmund Freud. These crusaders against the phony playwright from Stratford are split into groups of those who believe the true author was either Francis Bacon (these are the "Baconists"), Edward de Vere the 17th Earl of Oxford (the "Oxfordians"), Christopher Marlowe, William Stanley, or other less popular figures. Shapiro's book describes how Freud was a staunch proponent of the Oxfordian theory to the point where he was nearly obsessed with it. I know little about the debate or the facts behind each side but I am partial to the Baconists because of what I read in Richard Maurice Bucke's book Cosmic Consciousness which actually introduced me to this whole authorship question. Bucke's book is an enlightening study of the evolution of consciousness in which he proposes that mankind is evolving to the point where our entire species will be capable of achieving the condition of "cosmic consciousness" which is basically the sense of one-ness with the entire universe. 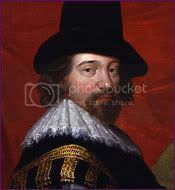 He proposes that more and more figures throughout history have achieved this state and he examines each known figure up until the time of the study (1901 or thereabouts) including Francis Bacon (pictured here) who, Bucke contests, must have been the author of the Sonnets which are no doubt an ode to the cosmic sense. 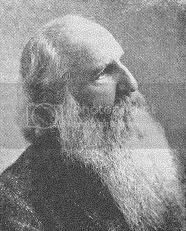 Richard Maurice Bucke was born in England a year before his parents emigrated to Canada and settled down on a remote rural farm outside of London, Ontario. His father was a highly educated Cambridge man who knew seven languages and had a library of thousands of books. He taught his son Latin and turned him loose among the books to educate himself, the boy received no formal schooling and just doing the hard work of a farmer, years before the automobile or electricity. When Richard was seven his mother died and his father remarried but then when he was 17 his step-mother also died and Richard Maurice Bucke decided to set out from the farm and go see the world. He went due south across the border into the United States and traveled around for three years doing whatever work he could find including working as a gardener in Columbus, Ohio, a railroad worker in Cincinnati and a deck-hand on a Mississippi steamboat. He eventually got a job as a driver in a wagon-train of 26 wagons that were to cross the Plains and head over to the "western edge of Mormon territory" in what is now the state of Nevada, a dangerous journey because at that time there were no permanent white settlements for the last 1,200 miles of the journey and "the peacefulness of the Indians was definitely not to be depended on." They journeyed for five months, eventually making it to Salt Lake City where Bucke received his pay and decided to keep going westward with a few others. These adventurers crossed the Rockies and started encountering roving bands of Native Americans who resented the presence of white men (considering what was going on at that time in history, the 1850s, it's understandable) and attacked them on sight. They had to fight their way from camp to camp and eventually ran out of ammunition and supplies and Bucke and a companion traveled the last 150 miles surviving on nothing but flour stirred into hot water until they staggered into a mountain trading camp and collapsed. They rested there for a little while and then started off again, crossing the deserts of the southwestern United States until they reached a gold mining community of 100 white men scattered over 1,600 miles of territory "without laws, without courts, without a church or a school." Bucke stayed there for a little while working as a gold miner and he befriended a pair of brothers, the Grosh brothers, who had discovered vast deposits of silver in what would become known as the Comstock Lode, an area in western Nevada. The brothers kept their discovery quiet and traveled along with Bucke looking for more silver deposits but the harsh mountain environment brought disaster as one of the brothers died and the other brother, along with Richard Maurice Bucke, decided to try to cross over the mountains to head to the Pacific Coast, even though it was the winter time! The other brother died along the way and Bucke, with both feet frozen was rescued on the brink of freezing to death by a mining party. Bucke had to have the whole of one foot and part of the other amputated and spent an entire winter in a hospital bed. When he got out he was 21 years old (!!) and thus had come of the age when he could receive his deceased mother's inheritance and he used this money to put himself through college and medical school. Years later, he would eventually have a mind-blowing spiritual experience one night while traveling home after an evening spent reading Whitman with friends and he was inspired to thoroughly study this "cosmic consciousness" and those figures throughout history who had experienced similar bursts of cosmic illumination. I'll eventually have much more to say about his book but that's all for now, folks. An FYI--I don't think John Kidd is dead (where did you get that information?). Thank you for commenting. I've been looking all over to see where I got that information from but can't find anything. Strange, considering the way I wrote it at the time ("died in his early 50s"). Must have read it somewhere. If he is still alive I hope there's still a chance we will see his Ulysses published. Can I have his email address, please? Somebody needs to publish this John Kidd Ulysses Experience already!